Since pressure decreases with altitude, t* increases with altitude. Radiation propagating at an angle 0 relative to the vertical acts just like vertically propagating radiation, except that the thickness of each layer through which the beam propagates, and hence the number of absorbing molecules encountered, is increased by a factor of 1/ cos 0. Hence, the optical thickness for radiation propagating with angle 0 is simply tv = t*/ cos 0. The equations of radiative transfer can be simplified by using either tv or t* in place of pressure as the vertical coordinate. The specific concentrations qi depend on p because we are using pressure as the vertical coordinate, and the concentration of the gas may vary with height;a well-mixed greenhouse gas would have constant qi. The dependence of the coefficients Ki on p and T arises from certain aspects of the physics of molecular absorption, to be discussed in Section 4.4. Figure 4.1: Sketch of the radiative energy balance for a slab of atmosphere illuminated by incident radiation from below. 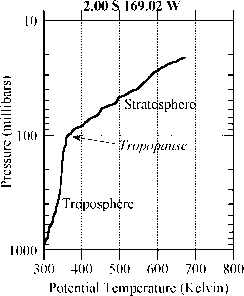 The equivalent path is thus the actual path weighted by the ratio of the mean pressure to the reference pressure.